A really enjoyable day. All of the children loved it... ...lots of opportunities for reasoning and problem solving. From the local area we welcomed Paradise, Westmoor, Boothroyd, Carlton, Thornhill, Eastborough and St. Paulinus Primary Schools, each bringing 4 eager and intrigued children and staff, all of whom had never experienced Imagination Gaming. After a few games for the early arrivals, introductions were done and we quickly set to concentrating on the games for today's tournament, with a few new ones to last week. This week we concentrated on Savvy, Storyline, Wildlife Rescue and Shaperise. One main feature of a lot of the games we use, is the ability to teach the games quickly and simply, this does not however mean they are easy. Often games with just a few choices to make can leave much more room for invention and creativity! Savvy is an incredibly simple looking game but very effective. Players simply eveluate the likelyhood on whether or not the next card will be higher or lower, whilst carefully managing the result of getting it right, wrong, or whether not to play at all. Shaperise is a real challenge for the memory. We use it in lots of different ways but today it was up to the players to try and memorise a prescribed pattern of up to 10 different blocks and then reproduce that image as quickly and as accurately as they can. This was a really tricky one! Wildlife Safari (shown here as Botswana) is a strategy challenge, and a classic we continue to use because of how good it is! The aim is to lay your cards to try and control the value of the animals, so that when the game ends, the animals you have collected are worth the most points. Something for the strategists... and the slightly devious! 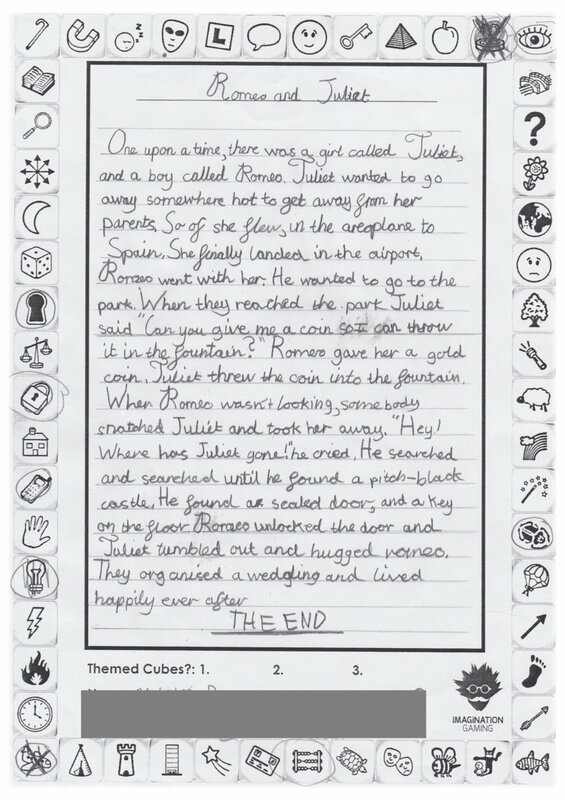 Finally we used Storyline, both the fairy tales and the scary tales versions. This one is a little bit more random as you try and influence the story's narrator to choose your plot twists... but that's the fun. A brilliant story-telling game. So, once everyone had a chance to study the games, hone their skills and share any tactics with their team-mates, we took a well-earned break to recharge, and then headed into the tournament. They then competed at each of the 4 games they had learnt, all vying to accumulate points for their teams and for themselves... which they all did admirably! Well this weeks individual highest points scorer was... Matthew Lofthouse, from Thornhill Junior School. Here he is with his certificate and trophy! As for the winning team... congratulations go to... Paradise Primary! Here they are looking suitably chuffed with themselves!!!! My day was fun but I really wanted to win... I lost 3, but I won 1! YAY! Today was cool because it was competitive, just as it was fun. Did this sound good to you? Well get in touch to see how we can sprinkle a little Imagination Gaming in your direction soon! Then why don’t you head down to your local library this summer and take part in their Mischief Makers summer challenge? Imagination Gaming will be there with a range of the craftiest, most devious, cunning and sneaky games you can imagine, where you’ll have to trick your opponents, bring out your bluffing skills and act like a real life Dennis the Menace as you challenge both yourself and your opponents in games of chance and skill. We have so many games, from across the world, that will allow you to test all of these skills in the nicest, friendliest and fun way. Here's a quick peek at some of the newest games below we have for you this year, such as Catch-A-Roo, Baffled, Shaperise and of course many, many more! If there are any games or type of games you’d like us to bring then just drop us an email to interest@imaginationgaming.co.uk or, better still, like us on Facebook and drop us a message on there? Take a look on our What’s On page to find out when we will be near a library near you soon. If we aren’t near your local library, have them get in touch with us on the email above and lets see what we can make happen! Summer Reading Challenge 2017 - What's been happening? It's official, 2017 will be the year of the Animal Agents! Extra specially, the event will be supported by original artwork from celebrated illustrator Tony Ross, the man behind Horrid Henry and many other fabulous looking children's books. As always we have some exciting plans for this with a huge range of new-for-2017 games, and popular favourites to suit the theme, and you can guarantee there'll be a some added extras to make our sessions Animal-tastic! Which are your favourite Animal flavoured games?! We'll be doing our bit, visiting 3 different libraries across Sheffield with a whole host of our new and classic games, and for the first time we''ll be unveiling games from our all new 12 Days Of Gaming promotion too! You can get an idea of what the history of the event is and all the locations you can get involved this year (including in the UK), on the ILG@YL official website here , so if you can't join us in Sheffield, we of course encourage you to get involved wherever you can! Of course, with our events being in Sheffield, it's yet another opportunity to get more Children's University credits too, as we are an official Learning Destination! Every year there is a new theme, with recent years focusing on Space, the Olympics, Dinosaurs and Mythical Maze. Each one has a large suggested reading list of associated books to complement the topic, and specially chosen as content to particularly excite and intrigue. 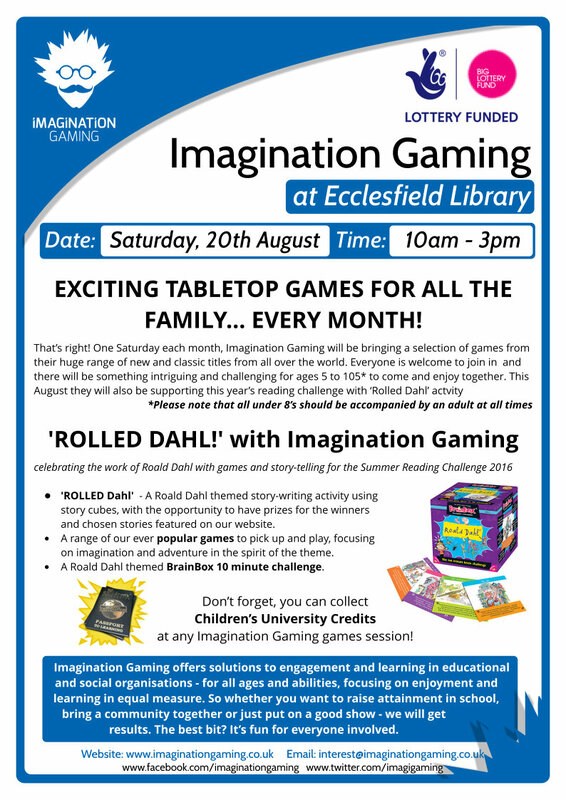 As part of our ever popular games sessions, Imagination Gaming are offering a new activity session to support and promote this year's Summer Reading Challenge and specifically the theme of the work of Roald Dahl. The sessions are anticipated to run across a series of locations and offer both creative and competitive activities to suit everyone. 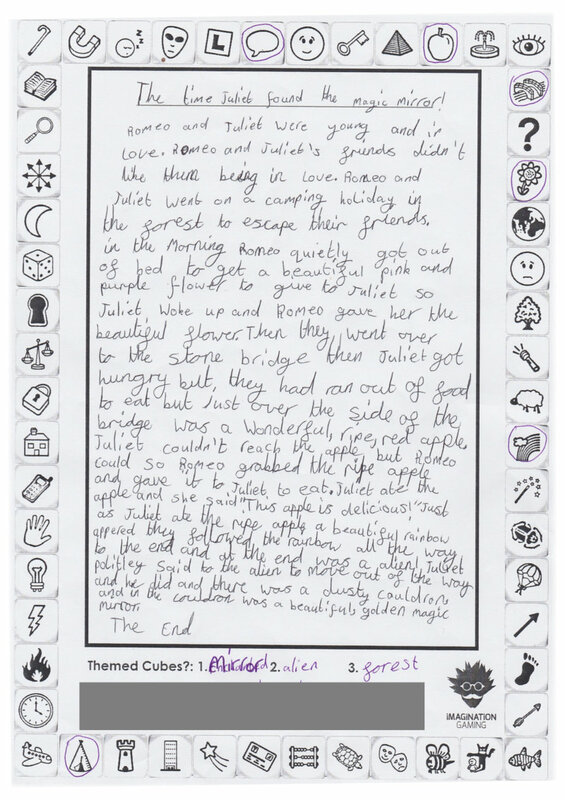 'ROLLED Dahl' - A Roald Dahl themed story-writing activity using story cubes, with the opportunity to have prizes for the winners and chosen stories featured on our website. A range of our ever popular games to pick up and play, focusing on imagination and adventure in the spirit of the theme. A Roald Dahl themed BrainBox 10 minute challenge and leaderboard! This games session is available to both libraries and schools as part of Imagination Gaming's popular games workshops, full of exciting card and board games with a cool twist for all ages. This offers a range of inspirational activities for children and families to participate in at a level to suit everyone. Note: Games and 'ROLLED Dahl' is typically suitable for 8 and up, 5 and up if accompanied by an adult depending on ability. As part of this year's Shakespeare Week celebrations, we took our specifically created 'SHAKEspeare's Stories' (click to read more) to Kirklees for a week. 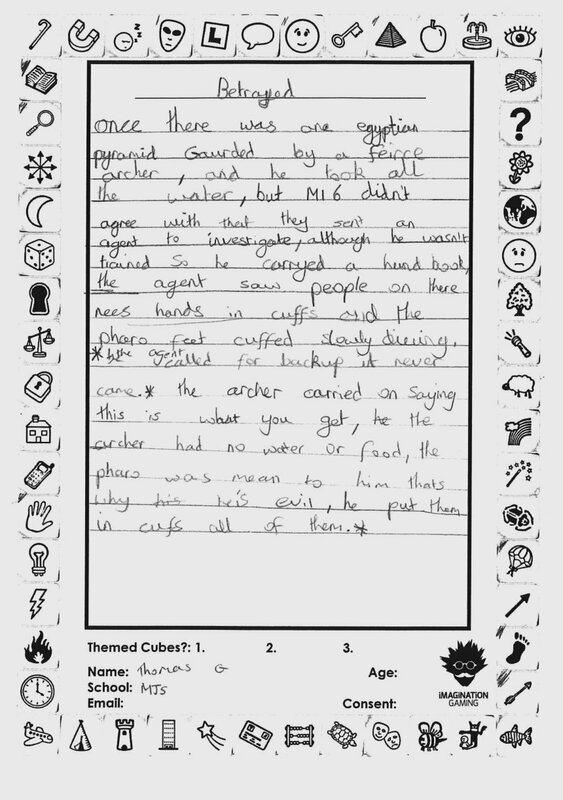 Here we worked with the library service to host a series of primary school classes from the area, in the libraries, and challenge them to some themed story writing challenges and a bit of gaming too. Each half-day session involved splitting one class into 2 groups for a bit of each to learn something new, have a bit of fun... and also a bit of competition! 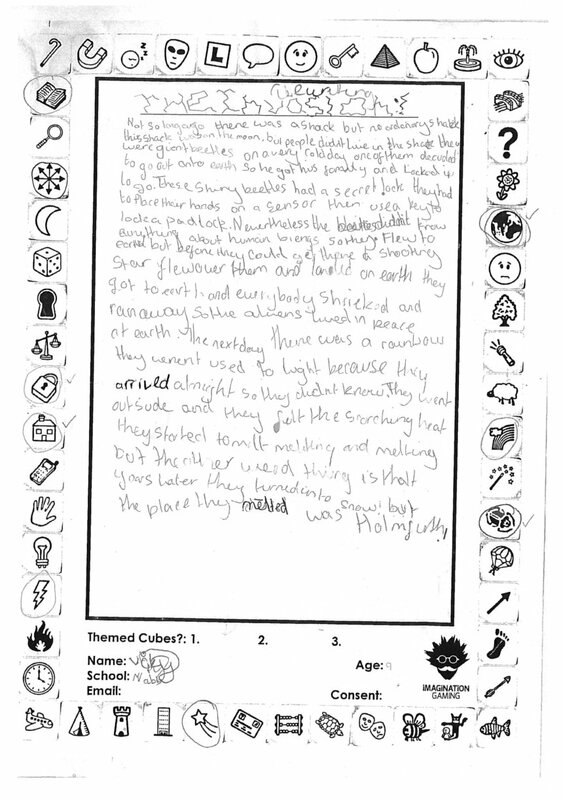 By the end of the week we had hundreds of story sheets, all very different and unique, and containg some thrilling ideas and fantastic tales. Every one of the completed stories is being put into a huge presentation book within each participating library so that the children can bring their friends and families to see there story, as well as it being available to all visitors with an interest. On top of that we picked a couple of stories out from each class to show here on the website... more notoriety! 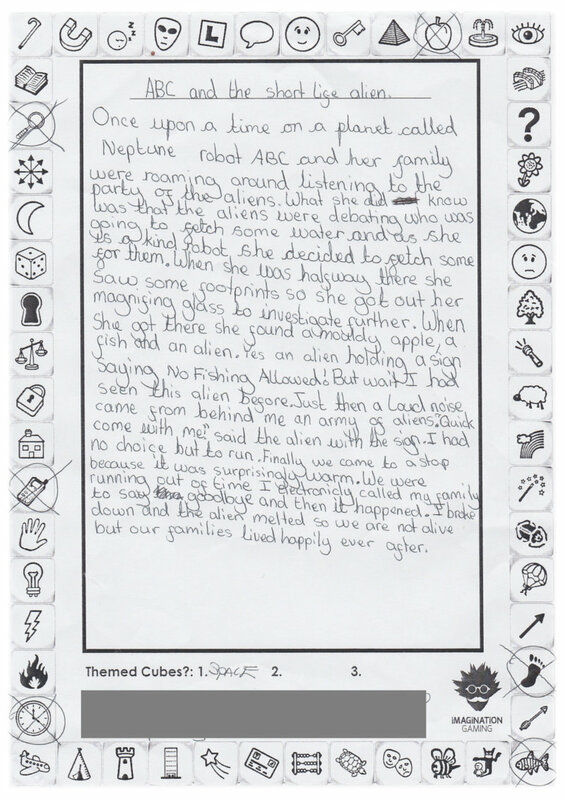 That and a little prize for the winners of some Rory's Story Cubes sets to keep and continue making crazy stories with. For once we weren't necessarily looking for the neatest, or the best spelling and punctuation ,(but we still expect them to try of course!) but more a spark of imagination or inspiration that made us take notice. On the day lots of these ideas started very interesting conversations and took us to very strange and intriguing places, but you can only fit so much onto one sheet of A4! So here's some of our favourites... for lots of different reasons! We have a fantastic new activity and competition, designed specifically to support upcoming Shakespeare Week and creatively engage young readers. 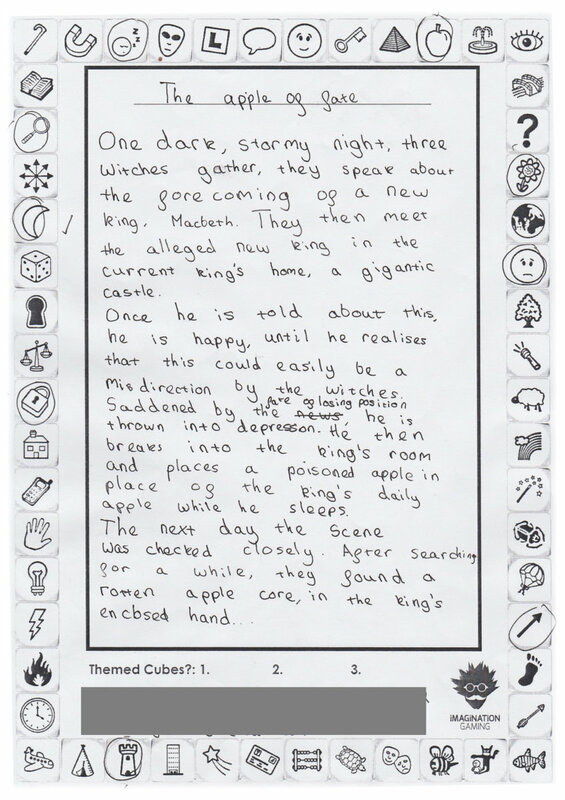 'SHAKEspeare Stories' gives players an opportunity to choose a creatively abridged plot-line from one of his famous tales of their choice, and recreate the story with characters and a setting randomly generated by 'shaking the story', with a new range of the worldwide phenomenon that is Rory's Story Cubes. Before Christmas we were approached by Sheffield Libraries to see if we had any activities to help support and promote Shakespeare Week 2016. We replied with a resounding - 'ERM?!...' ! I must confess this was a new one on me, even with everything we have done in schools for years and a son of school age myself, it was something I hadn't come across before, but it's a big thing. Shakespeare Week is a national, annual celebration that aims to give primary school children a fun, engaging and inspirational first encounter with the man and his work. Thousands of schools, families and organisations took part last year and the number contnues to grow. In 2016 it's the 400 year celebration! Back to the conversation with Sheffield Libraries - I think it went, 'Sure, no problem, give us a couple of days... we'll get back to you ASAP!' If you know us, you'll know we love a challenge, usually us giving them to you. We do pride ourselves on coming up with fresh ideas though, and this was, well, an opportunity shall we say. It's relatively easy to come up with ideas that contain the relevant content, but making it appealing, accesible and understandable to the your audience, that's the crucial bit. If an activity doesn't hit those 3 markers you're going to struggle. The biggest perceived barrier between Shakespeare and todays generations is undoubtedly the language. As I recall there's plenty of mirth and festivities and not an awful lot of L.O.L and smiley face icons! Regardless of the language used, the stories of Shakespeare are rich in plot and timeless. We simply needed to be able to get these across simply so that newcomers to Shakespeare could quickly appreciate them and realise they were still relevant in todays world, and then inspire them with an opportunity to get creative with Shakespeare as the starting point. 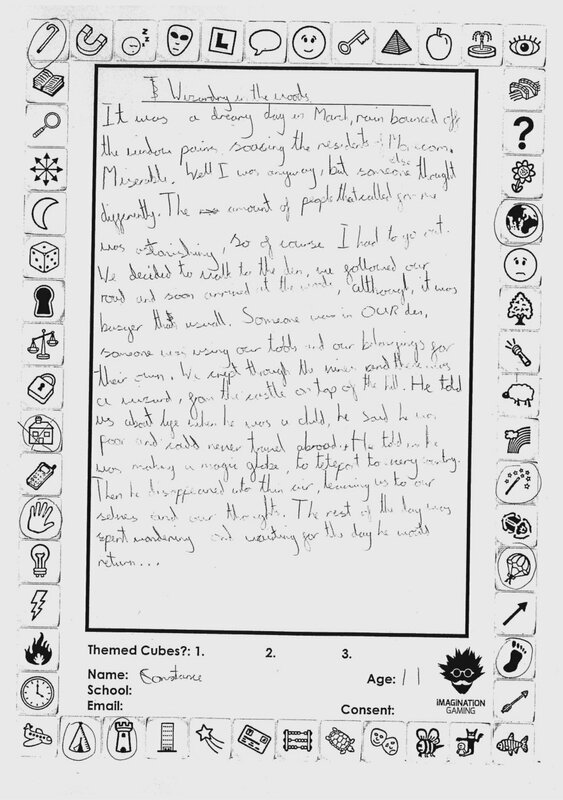 So we went back to an old favourite, the mighty Rory's Story Cubes and our previous story challenges. These simple story cubes have taken the world by storm in recent years and are great for developing communication and creativity from a young age. 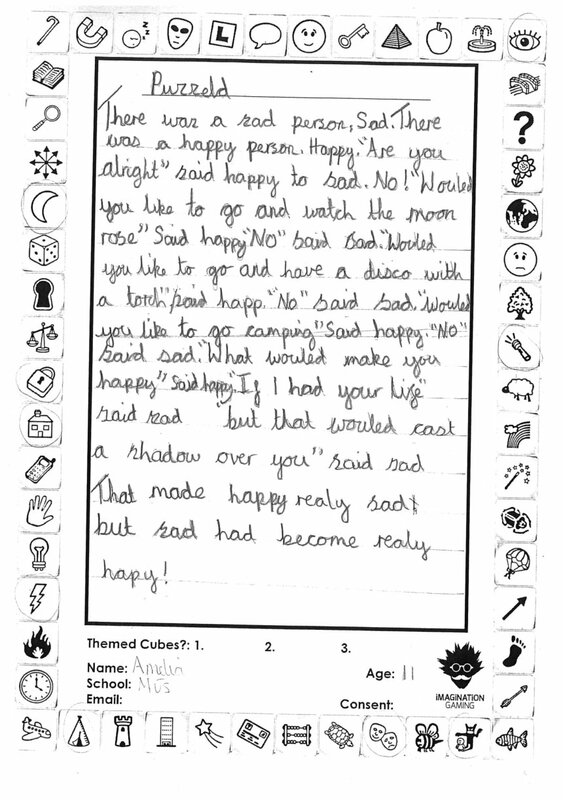 We use them regularly in our literacy games days and workshops in schools and libraries nationwide to great effect. 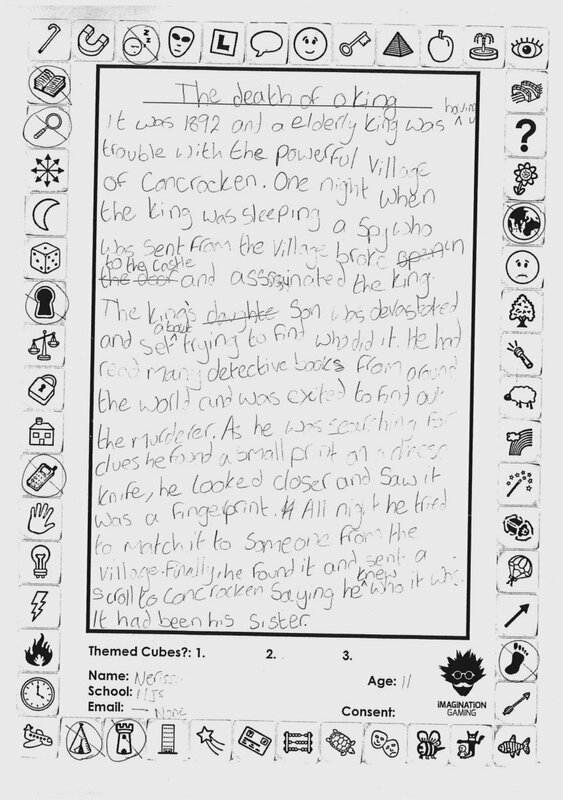 With 'SHAKEspeare Stories' we have found a fun way of introducing Shakespeare and getting players to write their own stories based on a similar theme. We provide participants with a menu of extremely abridged versions of his more famous works, just 2 or 3 sentences that get the essence of the story across and no more. 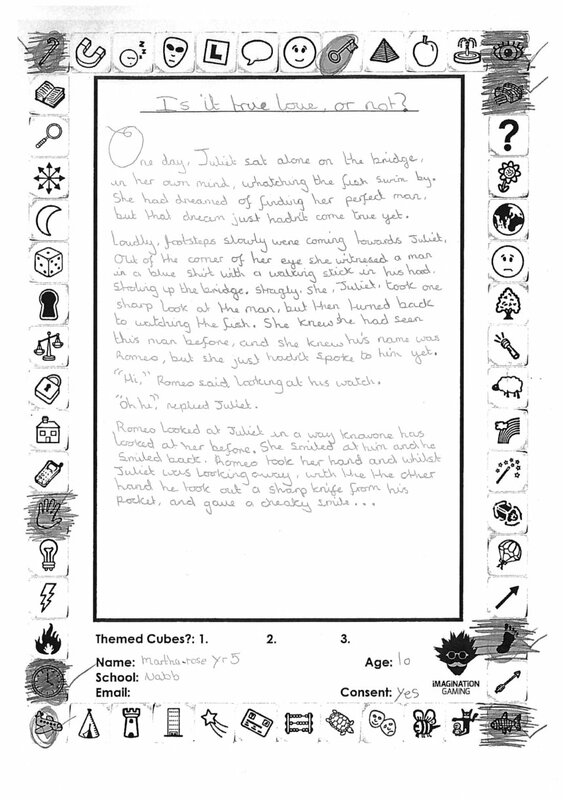 This enables players to quickly recognise the basis of each story and from that they can decide the basic arc of their tale. They can then 'SHAKE' the story cubes and introduce random elements to their story, knitting them together however their imagination sees fit. Imagine taking the plot-line Romeo and Juliet: A young couple fall in love, their friends and family try to keep them apart but they continue to meet whenever and wherever they can. They manage to escape together but there is a sad ending when something unfortunate happens to both of them. 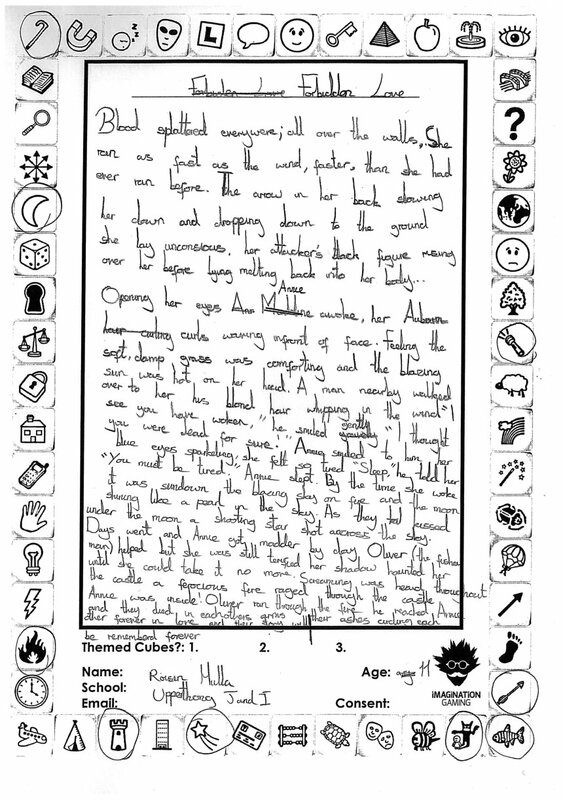 Players then write their own short version including the content on the dice they rolled, which include characters, animals, objects, emotions and settings. What if Romeo was a lonely tortoise and Juliet is a beautiful fish?!!... and the events and emotions and other characters on the dice they have been given would help form the rest of their very own story. 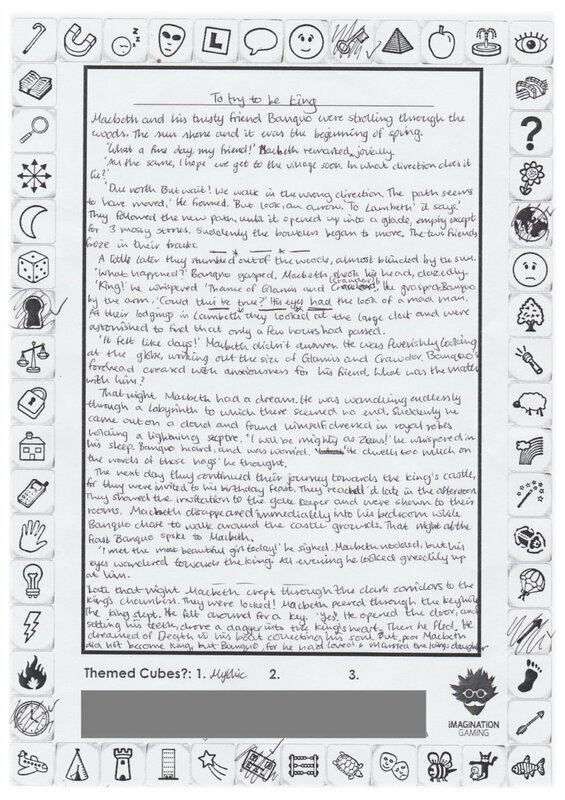 There are also sets of themed Story Cubes that would be authors can use to give their story a specific feel, such as mythic, enchanted, prehistoric... or even set in space! 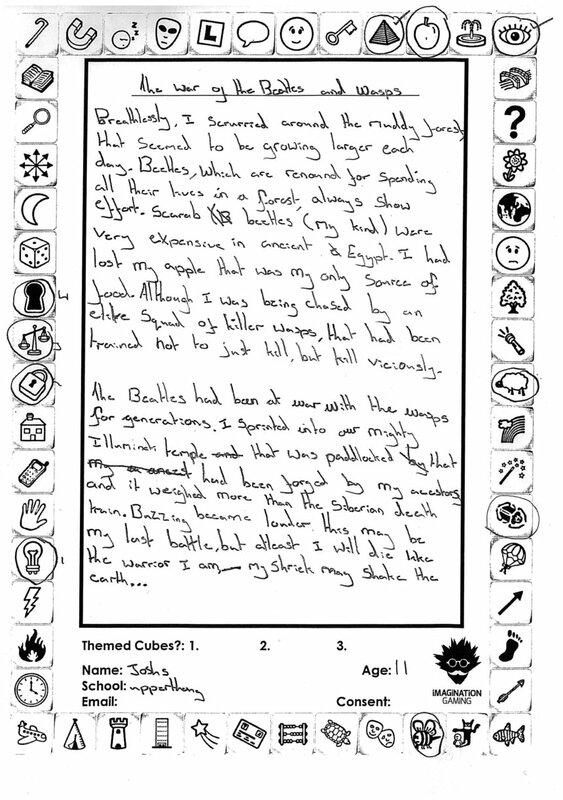 In addition, in larger projects, young Shakespearians will be invited to submit their short stories and have them exhibited on Imagination Gaming's website and shared by the libraries, promoting their success and the event itself... and there will be prizes for the judges favourites too! This is an excellent and easily accessible way for newcomers to Shakespeare, old and young alike, to get creative, have fun, and begin to appreciate the fantastic story-lines at the heart of his work and their timeless appeal... and dig a little deeper. 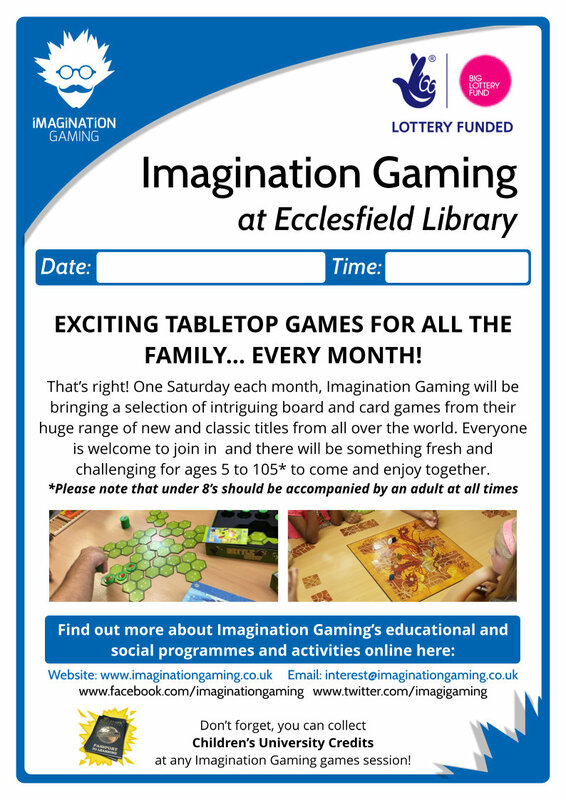 This will be available as part of Imagination Gaming's popular games workshops, full of exciting card and board games with a cool twist for all ages.This offers a range of inspirational activities for children and families to participate in at a level to suit everyone. If this or any of our other activities inspire you, contact us here and we'll see how we can help you too!